My Sister's Bones by Nuala Ellwood is a very highly recommended psychological thriller. This is an excellent, compelling, unforgettable novel that will keep you guessing. Kate Rafter, who has been a war correspondent for fifteen years, has returned back to the U. K. from coverage in Aleppo, Syria. While she was out of the country her beloved mother died and Kate was unable to attend her funeral thanks to her alcoholic sister, Sally, who did not contacting her in time. Now Kate has returned to her childhood home in Herne Bay, Kent, to sign some documents and view her mother's will. But after covering wars for years, Kate is also suffering from nightmares and hallucinations. She hears the cries for help and voices of those people she encountered. Feeling under siege is not a new feeling for Kate, though, as her father was an abusive alcoholic who regularly beat her mother. As she stays in her childhood home, all the memories of abuse come rushing back along with Kate's regular visions and nightmares from the wars she has covered. But this time Kate is convinced that she is not seeing things when she hears a boy crying for his mother and sees him in her garden. She is convinced that the woman next door, an Iraqi refugee, is hiding abuse by her husband and that the boy in in danger. The woman claims, however, that she has no son and that her husband is away. In between chapters of Kate's experiences in part one of My Sister's Bones are excerpts of a psychiatrist interviewing Kate. We know Kate has been arrested for something, possible related to her hallucinations and hearing voices, and she is being held while her mental health is evaluated. How reliable of a narrator is Kate? Is she imagining things? Kate is a fully realized character draw with skill and depth. Yes, she is flawed and we know she is suffering from her years of war coverage, but she still inspires empathy and support while you are reading. Her sister, Sally, is an unsympathetic character who is vividly described and desperately flawed. It seems that both sisters are so damaged from their dysfunctional childhood that normalcy or recovery may not be an option. 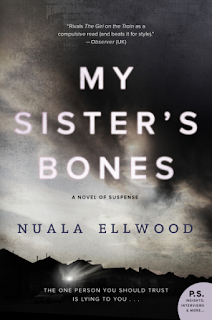 The writing in My Sister's Bones is exceptional and the plot is compelling and clever. This novel was impossible to put down. I devoured this book almost effortlessly - the pages just flew by - and was surprised at the twists the novel took. Ellwood has several shocking surprises that I never saw coming. She also skillfully covers domestic violence and the violence in a war-torn country, with insight and sensitivity as she draws comparisons in her narrative between the effects of both violent situations on the victims. Admirable, excellent, remarkable - I liked everything about this novel. Disclosure: I received an advanced reading copy of this book from HarperCollins for TLC Book Tours. Wow! I can see why you couldn't put this book down - I want to pick it up and read it all the way through right now.